Jawaharlal Nehru University's students' union elections always generate enthusiasm and curiosity. But this year, it is set to become even more interesting with all major parties active on campus fielding women as their presidential candidates. This is a first for the varsity. JNU, a Left bastion for years, has recently seen a mammoth change in terms of students’ freedom to dissent. Under Vice-Chancellor M Jagadesh Kumar, known to be close to the ruling Bharatiya Janata Party and its mentor Rashtriya Swayamsevak Sangh, dissent against the government has been quelled and the space for scholarly debate and a multiplicity of opinion has arguably shrunk. Seven candidates are running for the post of JNU Students’ Union President. Aparajitha Raja, the daughter of Rajya Sabha member and Communist Party of India leader D Raja, is fighting from the All India Students’ Federation (AISF) ticket, the party to which former JNUSU president Kanhaiya Kumar also belongs to. The AISF decided not to support the call for a united Left and fielded Raja as its own candidate for the post of president. “These are dark times for the university. 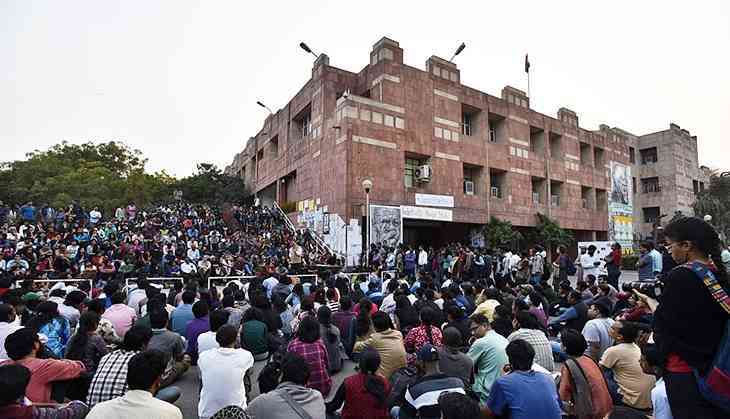 The seat cut in JNU in MPhil and PhD courses led to at least 1,000 students eliminated from our campus who could have been admitted to JNU, had the administration not decided to eliminate 85% of seats,” Aparajitha, who is working on her PhD in political science, told Catch. The university reduced the intake of students for MPhil and PhD programmes from 970 seats to 139 this year. The All India Students’ Association (AISA), the Students Federation of India (SFI) and the Democratic Students’ Federation (DSF) have formed a “United Left Panel” to fight the JNUSU polls. The United Left Panel have fielded Geeta Kumari as their presidential candidate. Kumari has promised to safeguard the ‘democratic essence of JNU’ in the face of multi-pronged attack by the RSS-BJP government nexus. She even blamed the ABVP for the disappearance of Najeeb Ahmed in her speech. Birsa Ambedkar Phule Students’ Association (BAPSA) candidate Shabana Ali told Catch that her party represents the Ambedkarite Movement and she will work towards the betterment of the oppressed communities and minorities on campus through the discourse unity of the oppressed. She aims to implement a reservation policy for students and teachers belonging to SC, ST and OBC communities. Ali also added that the United Left Panel was formed to suppress and attack minority voices that BAPSA represents and not just to fight the ABVP threat. Vrishnika Singh will be representing Congress’ student wing National Students’ Union of India (NSUI). She said that there was an urgent need for better health care facilities on campus and specified that several research scholars at JNU were suffering from depression and that there was no counselling facility available on campus. She also criticised the budget cuts and privatisation of higher educational institutes in the country including JNU. The Akhil Bharatiya Vidyarthi Parishad (ABVP) candidate Nidhi Tripathi slammed the Left Unity Panel and said that JNU had become a victim of ‘Left unity’. “The incompetent JNUSU of the past has failed to launch a single successful movement for students’ interest. The Left Unity Panel was formed because ABVP is a massive threat to them. Students know how incompetent the students’ union has been. Students have been cheated by the previous JNUSU. The ABVP looks forward to bring about a change this time,” Tripathi told Catch. Two independent candidates vying for the president's post in these elections are Gaurav Kumar and Farooque Alam. JNU Students’ Union elections are scheduled to take place on 8 September.